This entry was posted on October 14, 2012 at 3:44 AM and has received 1115 views. There are currently 1 comments. Print this entry. A friend was concerned about LinkedIn stealling email addresses. I have been a on linkedin for years and not had a problem with stolen email addresses. At the time I joined you had to explicitly upload your email address book or enter your gmail userid and password to give them your emails. I imagine that is still the case today otherwise how could they get your address book. Additionally once you are a member you can adjust your bacon preferences (bacon is like spam in that there is more of it than you want but it is coming from a service you signed up with) to reduce or eliminate notification email. The same is true for Facebook. I have used linkedin in the past mainly as a souped up address book for my contacts that is automatically updated by them when they move or change jobs. If friend is not getting my emails then sometimes a message via Linkedin or Facebook will reach them when my real emails have not. I have used the search feature sometimes to find a friend of a friend with a certain skill or interest with some success. I also know people who like it's lists feature and the job advertizement feature. When I did more sales I would also use it to research background info on a lead or to get a referral to them. When I was running the CFUnited event we used Linked, Facebook and Twitter to promote the event using the events feature and fan page, with some success. I used to get invitations to joint some other social network (Plexo) but I got tired of them and I think I joined the network and then opted out of all the bacon. Worked for me. Alternatively when I have been getting more bacon than I want I have set up an email filter to automatically file the emails in a subdirectory so that I don't have to read them (unless I get curious again). I know this is easy to do in both Thunderbird and gmail and I imagine most other email programs let you do that do. This entry was posted on October 14, 2012 at 3:21 AM and has received 1001 views. There are currently 0 comments. Print this entry. These insect eye cameras are smaller than a finger nail. They have infinite focus without moving parts. Once production ramps up they will be super cheap. Combine with micro transmission chips for a super mobile camera that is so cheap it could be thrown away after single use. Just think where you could put cameras using this, or where a government or corporation could put them... Every object in a room, car, books, eye glasses, on micro drones, balloons, even on food for sale, plants, pets, children, shoes, inventory equipment, on credit cards. To track, monitor behavior, prevent theft, control rioters... Everyone could become a super spy with this technology. Who needs a billion dollar spy satellite when you can uses a bunch of 1 cent cameras sprinkled around an area? Every action and change could be recorded. The insect eye lens can also be used in reserve in a micro projector that can put a clear image on an uneven surface and is only 6 mm thick. Think movies and adverts from your cell phone. Or embedded in the streets like the personalized ads in the movie Minority Report. This entry was posted on June 1, 2012 at 6:59 PM and has received 1307 views. There are currently 0 comments. Print this entry. This entry was posted on May 3, 2012 at 5:08 PM and has received 1018 views. There are currently 0 comments. Print this entry. Here are some of the things I am using Evernote for. Interested to hear what else you are using for? This entry was posted on February 13, 2012 at 10:31 AM and has received 1110 views. There are currently 0 comments. Print this entry. This Japanese man has invented a machine to convert plastic garbage back to the oil it was made from. Clean up the envirnoment and need less oil too - double win! This entry was posted on January 10, 2011 at 2:31 PM and has received 1190 views. There are currently 0 comments. Print this entry. This entry was posted on December 1, 2010 at 4:27 PM and has received 1284 views. There are currently 0 comments. Print this entry. NY Times article on a energy bubbles discovery in our galaxy that are nearly as big as the galaxy itself. Wow this is a major shift in what we know about where we live! Maybe relates to 2012 stuff too as we align with the galactic core. 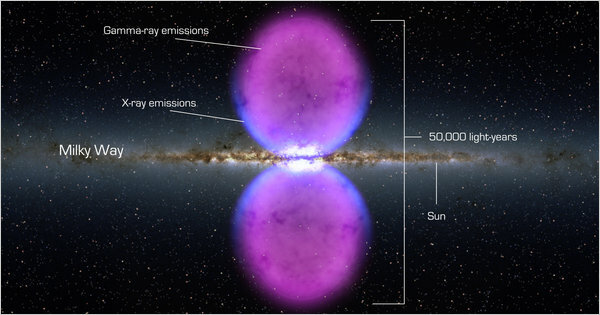 ¶ “And we think we know a lot about our own galaxy,” Dr. Spergel added, noting that the bubbles were almost as big as the galaxy and yet unsuspected until now. “Dark matter has been there billions of years,” Dr. Finkbeiner explained. “If something has been going on for billions of years, you wouldn’t expect a sharp edge.” He and the other scientists said this did not mean that dark matter was not there clogging the center of the galaxy, but that it would be harder to see. This entry was posted on December 1, 2010 at 3:13 PM and has received 1192 views. There are currently 0 comments. Print this entry. This entry was posted on November 24, 2010 at 3:10 PM and has received 1424 views. There are currently 0 comments. Print this entry.